It is the catchphrase that everyone knows especially if you are a kid of the 80s “Pork- The Other White Meat”. Ad campaigns ran on TV and in the grocery stores. 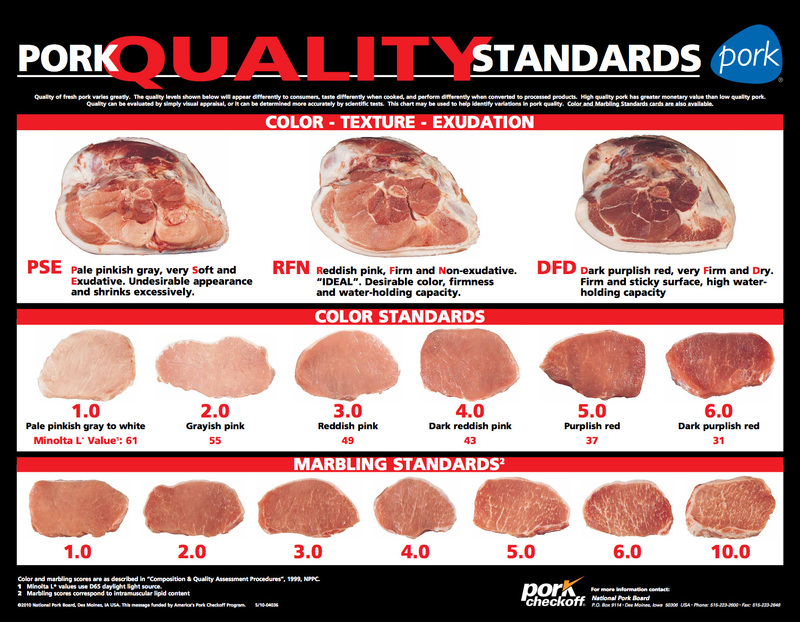 Pork was hailed as healthier than beef with its bright red coloring and fat and even rivaled chicken for its leanness. The growing American fear of “fat” was creatively played on to the point that today most Americans no longer realize that pork used to be a marbled RED meat just like beef. So how did the US become so bamboozled? Once upon a time, pork was the food of everyone. Pigs have an amazing ability to change anything they foraged into meat, but as indiscriminate omnivores they will pretty much eat anything and everything if they are hungry. As you can imagine that left some folks squeamish about eating them, but for those who needed protein and had limited means, they were the perfect animal. What’s more anyone who has had a nice slice of prosciutto can tell you that salted and cured meat can only get better with time. In the pre-refrigerator in every house days, it was crucial to have the means of preserving meat. Pork was the perfect option since fat preserves. If you ask someone from outside the US, ‘what is the meat of America’ you will most likely be told beef. After all, we are a nation of cowboys right? Historically though, we have been a country of pork eaters. Beef was too expensive for most people and did not keep as well. It was only when more and more people began leaving rural areas and moving into the cities that this slowly began to change. With the advent of refrigeration, people could purchase more beef and store it for longer. With the growing concerns about fat, they switched to chicken. So what did that mean to the pork industry? They needed to make changes to their pork in order to bring it back into popularity. Through the help of the government, universities, breeders, and other organizations, they came up with the perfect pig that would produce lean meat in record time and be able to do all this on a very different diet than before. One side benefit was that not only was the meat leaner, but it also was pale and would visually link it to chicken which was considered to be healthier. It was around this time that a study came out linking an increased risk of heart disease with red meat scaring people further away from fat. What the study failed to address is there are beneficial and harmful fats and that the human body has been designed to consume animal fats in moderation. Once considered the best part of the pig for its multiple uses not ONLY as a food product but for its other lubricating properties, lard became a bad word. The fatty meat that preserved better was no longer being purchased in bulk to be fed to sailors, miners and slaves. At one point, the meat was considered less important than the lard which could be used as an industrial lubricant or cooking oil. Instead, canned food, refrigeration, and plant based oils became all the rage. Plant based oils simplified the process of getting oil since all you had to was raise the plant and extract the oil rather than feed the plant to a pig and THEN extract the oil. Pig breeders saw the trend and began breeding pigs for their meat rather than their fat which lead to increasingly leaner and leaner pigs. Enter the age of the CAFO (Concentrated Animal Feeding Operation) which is a word that strikes horror into farms like Firefly Farms. At another time, we will go into all the dangers associated with this form of animal production. On these “farms” pigs are kept in confinement their whole lives, never see the sun, walk on fresh grass, or get to be pigs and experience normal pig activities. This further affects their already lean meat. Myoglobin is the protein responsible for giving meat its red color and it carries oxygen to the muscles. In an animal who is confined and not moving the amount of myoglobin in the muscles is decreased. That is why on a chicken you have white and red meat, white in the breast since they are now nearly flightless, but red in the drumsticks as they still run around. In a study conducted by Texas A&M, it was found that factory farmed pigs had myoglobin levels comparable to chicken or fish. Take a moment to internalize that. An animal that can easily reach 600 lbs. had the same levels as an animal that rarely tops 10 lbs. Pigs are also rooters and those who are able to root naturally get all their minerals from their environment which includes iron, another contributor to red blood. Pigs at CAFO never have that opportunity which is why the piglets need to be given a huge shot of iron after birth whereas piglets born on pasture get theirs directly from rooting. However, as CAFO piglets age they can develop anemia which contributes to the paleness of their flesh. The end result of all the breeding and CAFOs is pork that is incredibly pale with almost no fat except for that located on the very edge of the meat. This is the meat they needed to market beginning in the 70s and 80s. One thing that they could not use in their campaign was that this newer whiter meat was in anyway as flavorful as pork’s previous red incarnation. So they didn’t. Many of us have strong memories of super dry pale pork chops on our dinner plates that were only palatable with extra sauce so we could swallow the meat. The term PSE (“pale, soft, and exudative”) began being used to describe some pork given its unappetizing appearance. It turns out that this ‘new’ meat came from pigs who are completely neurotic as a result of their breeding and living situations. And yet, this meat came from leanest pigs, the epitome of the breeding program. With an advertising budget that would reach 9 million dollars and figure skater Peggy Fleming as the National Pork Boards’ spokeswoman, they launched their new campaign with the slogan “Pork- The Other White Meat” in January 1987. By years end, the new campaign was a success and ranked right up there with “Got Milk?” and “Just Do It!” In 2011, Adweek wrote that the campaign is “among the most successful rebranding moves in the history of the food biz.” It is a campaign that has had long term effects on the American diet and relationship with food. Even though pork is STILL a red meat as it is mammalian versus white meat which can only be used to describe avian (bird) or fish, it has been successfully disassociated from beef and lamb. Remember that study that linked heart disease with red meat? In 2010, Harvard did their own study which found no evidence that eating red meats leads to heart disease. Instead the impact on cholesterol levels was dependent on what diet the animal was raised on. In addition, the dark meat of an animal actually carries more nutrients that your body needs than white meat including but not limited to B vitamins, iron, zinc, and selenium. So everything we as Americans have been lead to believe about pork for the longest time is in reality wrong. This includes how well done our pork should be cooked. We have long believed that pork needs to be cooked to the point of no pink (if there was any to begin with) in order to safely consume it. Anything less than medium was deemed unsafe up until 2011 when the guidelines for pork were changed to be on par with lamb and beef. The previous guidelines were in place for a reason, pork raised in CAFOs rather than on pasture has a greater chance of risk to the consumer because disease could spread so quickly from one animal to the next. The USDA changes though is because the CAFOs claim they have improved their pigs’ diet AND can better protect them against disease because they are indoors and away from wild animals that might spread disease to them. These are the same people producing pigs so anemic, confined, neurotic and stressed that their meat it mushy and gray. Additionally, precautions have to be taken to prevent them from having a sudden shock (even as simple as a loud noise) or they might drop dead. This is why we shud der when anyone refers to our pork as “the other white meat”. 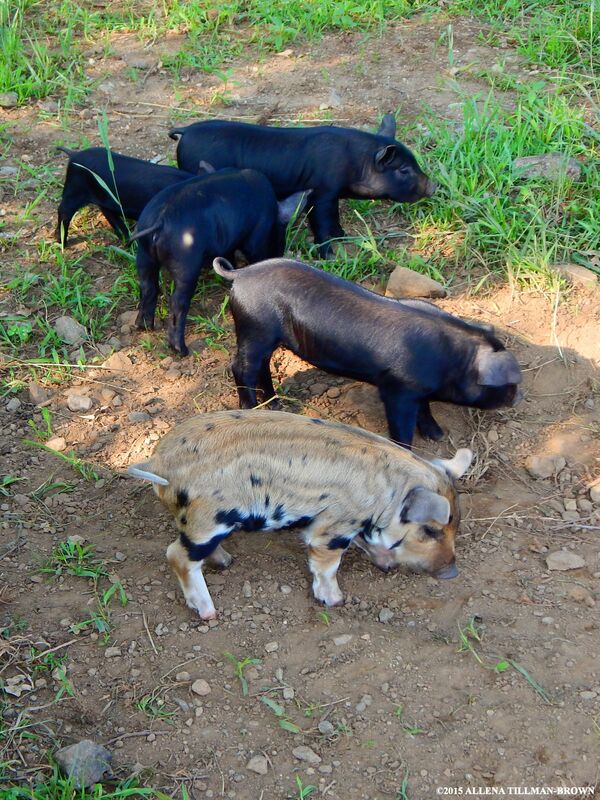 Anyone who is raising their pigs on special feed, wild forage, and outdoors wants to distance themselves as far as possible from the commercial pork. It is not just about the taste though that is incredibly important to us, but is about the whole lifestyle of the animal. We want pigs that are happy, social, and getting to do piggy things like wallow and rooting for treats. We believe that what they eat (no fillers in our feed!) and how they live greatly impacts their meat. The only confinement our pigs experience are the portable electric fences that keep out any possible predators and stop unplanned pregnancies. They never develop neurotic issues like ear or tail biting. When it comes time for them to walk the Green Mile, they have their human handlers with them every step of the way giving them treats and scratches to ensure that their last moments are calm and as stress free as possible. All of that translates to the finished product. Our meat is red. It has beautiful fat both wrapping the muscle and intramuscular. Best of all, it has flavor like no other. The newest National Pork Board campaign is “Pork: Be Inspired”. This is a slogan we can get behind, but for our own reasons and with a slight modification “Heritage Pork: Be Inspired”. We hope that consumers will be inspired to seek out alternatives to the pork found in the grocery store and instead find local farmers raising pigs on pasture. We hope they will even go so far as to seek out Humane Certified pork (and other meats too) to further improve the farming community. We hope that consumers will be inspired to try new recipes to fully experience all the nuances of pasture raised pork. So when you visit us at the Farmers Market compare the coloration of our pork vs. our beef vs. our chicken and you will wonder how anyone could ever confuse our pork for just another white meat.